EPIC Expo, Western Canada’s largest sustainable lifestyle showcase, is coming to the Vancouver Convention Centre May 11th to May 13th. Over 20,000 people will attend Vancouver’s 6th annual EPIC Expo to check out 300 exhibitors, shop for eco-friendly products, get ideas for the home and office, and be entertained. 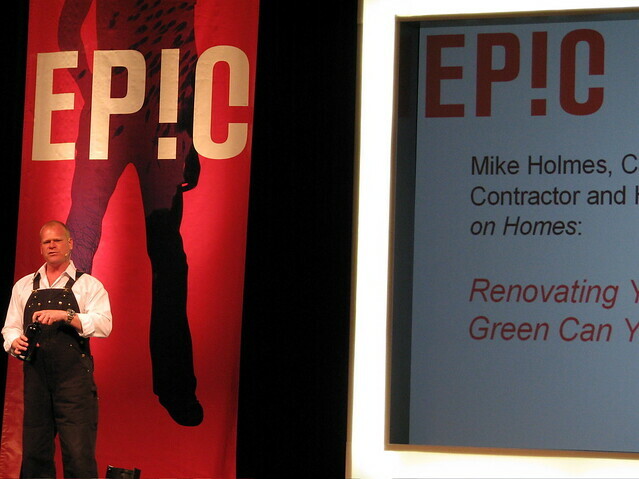 Mike Holmes speaking at EPIC Expo Vancouver in 2008. Check out the EPICurean Corner to sample from BC’s finest restaurants and wineries, discover eco-fashion on the EPIC Catwalk, and play in the EPIC KidZone with the Granville Island Toy Company. You can also test drive a Toyota or luxury Lexus hybrid vehicle at the Ride’n Drive station. The main stage will feature: Urban Farmer Chris Thoreau, Peak Performance Project finalists The Boom Booms, Founder of Five Hole for Food Richard Loat, Harvinder Gill from the Recycling Council of BC, Co-Founder of the Green Party of BC Adriane Carr, and more. Tickets are currently available for $20 (3-day pass) or $12 (for a single day). There are also child, senior, and student rates. Event hours are Friday, May 11, 2012 from 1:00pm to 8:00pm; Saturday, May 12, 2012 from 11:00am to 7:00pm; Sunday, May 13 (Mother’s Day) from 11:00am to 5:00pm. I will draw 4 winners on Saturday, May 5, 2012 at 8:00am. You must be 19 years of age or older to enter and win since the EPICurean Corner serves alcohol. Follow EPIC Expo Vancouver on Facebook and Twitter for more information. Update The winners are: Kim, Vanessa, @flipnfunny, and Tara. I’ve been crossing off the days on my calender for this Expo and winning tickets would be totally amazing! Use LED lightbulbs, if not, use dimmers. I would love to win these tickets! My top tip for living green is to cut back on garbage by using containers like Tupperware and composting food scraps. I try to buy fresh foods over processed foods. Purchasing fresh food means far less packaging. This in turn reduces the amount of air pollution, landfill waste and energy consumption. When you take into account the greenouse gases emitted to create the paper, plastic and metal packaging for processed foods, the energy consumed to power these factories and the garbage left behind, it’s easy to see why fresh is better. For apartment dwellers, try growing your own herbs, or even a container vegetable garden on your balcony (never mind the 100-mile diet, try 0-mile!). You can compost even if you don’t have a balcony with vermicomposting (worms). Buy less in general, buy less processed and packaged food in particular. Take advantage of all the local organic produce and local wild fish that can be found in abundance here! Join a CSF/CSA, or one of the many urban community gardens. Plant flowers that are beneficial to bees, because we need them! Don’t use harsh chemicals on your plants, as not only is it bad for you, but also the earth and the bees and other organisms that interact with them. Bike or walk once in a while, it’s fun and good for you! Don’t be overwhelmed, just try changing one thing at a time and you’ll be glad you did! Use human powered transport whenever you can! Walk, take stairs instead of elevator, bike, run! We have some of the cleanest tap water in the world! Stop buying bottled water, it’s a waste of money and horrible for the environment. My tip for living green is to always carry an enviro bag in my work office, and in my purses… then I can avoid plastic bags when I randomly shop! I’m starting a worm compost and I believe it’ll reduce my organic food waste by half. Green tip: I teach my kids (4 and 2) to conserve water everyday, to turn off lights when they don’t need them and we encourage them to recycle and reuse as much as possible. We use our own bags all the time at the grocery store, and we walk walk walk! I recycle, have an indoor compost and eat local! my best tip for living green is simply to use the trash as a LAST RESORT. recycle, compost, upcycle, donate, anything! Wash laundry in cold water/hang to dry! Recycle, use transit, turn off all unnecessary electricity. I would recommend bringing your own mug to work, growing your own vegetables and herbs, and trying to use transit as much as possible. Turn off lights when not needed. Use a programmable thermostat. Don’t water the lawn ever. Let it go yellow. My top tip for living green would be to share all the great ‘green’ tips above my post. The more people know about these tips and do these, the greener we will all be. I’m growing my own herbs and veggies, everyone should try it, it’s great! Conserve electricity and water whenever possible! I transit to work instead of driving. Walk as much as you can and take public transport!! My best green tip is to live local as much as possible and make NO trips by plane, car or even bus and train if it can be avoided. Use the good, old, heel-toe express! I shop at farmers markets and avoid buying food in packaging whenever possible. Ride your bicycle! Vancouver is a fantastic bike-friendly city and the most of the bike route roads are so beautiful and quiet. Take public transit and walk instead of driving. I have two tips for green living and they are both about gardening. 1) Use a rain barrel to collect water, and then use that instead of water from your hose. Why would you be wasting the small amount of drinking water in the world, if you can prevent it? 2) Use a push mower to do your lawn. I know it takes 3x as long, but it’s way better for the environment and let’s be honest…it makes your arms look great! My top tip is when going out to eat bring Tupperware for leftovers instead of styrofoam! Try making your own household cleaners using ingredients like vinegar, washing soda and castille soap. You’ll save money and the environment, and it’s easier than you think! I have a set of cutlery including chopsticks that I carry with me in my purse as well as a travel mug and water bottle that I use on a regular basis. It sounds simple but turning off lights when you leave a room, and make sure your taps are tightly turned off to avoid dripping makes a big difference! i haul my travel mug wherever i go! I use coffee grounds for gardening. i have my own garden and grow seasonal vegetables for the whole family! I always pick up one piece of garbage every day on the street no matter where I am and am teaching my two year old granddaughter to do the same. I try to reduce my waste in our house. recycle recycle recycle…i am good with the shopping bags but those little plastic veggie bags…not so good…so i am collecting all of them and putting them with my pop cans so that when i return my cans i take my bags and recycle them too. Bring your own reusable container to take out restaurants! I use transit and when printing, the other side of the paper. Buy whole foods not processed packaged things! Support your local farm markets, they have local produce which means less transport, less emissions! Recycle everything.. it is possible! Wash things in cold water and hang them to dry.. AND Don’t leave the tap running while u brush your teeth.. such a waste of water! My tip for living green is to first of all wash all your laundry in cold water and then when drying the clothes, always have a dry towel in the dryer, it absorbs water from the wet clothes and makes the drying time shorter. Reduce where you can. E.g. reduce the amount of trash you throw out. Compost. Buy products with less packaging. Use public transportation or bike, skateboard, walk, jog, run, saunter, sashay, etc instead of driving. Go green! Ride you bike to work or you public transportation. Eat what is in season – keeps with the wallet happy too! Cold water wash, hang dry clothes, and TURN OFF THE LIGHTS!!! I use plastic food containers as dog food/water bowls when I go hiking or for a long walk with my dog!